My research interests are centered on two main topics: characterization and understanding of the relationship between ecological patterns at large spatial scales, and the impacts of man-made structures into wild animal populations. Both topics are driven by a practical problem: the need to provide sound scientific guidelines to practical problems of conservation. 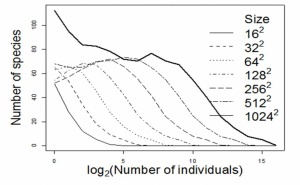 Concerning the former, I have been applying methods from several fields to better understand and describe the scaling of species abundance across spatial scales. Concerning the latter, I have been particularly interested in the impact of traffic mortality on the survival of bird populations. I am also interested in the application of Bayesian methods to data analysis because I perceive the Bayesian methodology as a more unified approach to data analysis and an easier way to communicate scientific results to managers and policy makers. In the past, I studied theoretical space plasma physics, with emphasis on computer simulations. Computer simulations remain one of my favorite areas of research, and I have been particularly interested in patterns of species diversity in space and time.